Camping Le Palais de la Mer är en camping i Sainte-Marie, Pyrénées-Orientales, belägen vid havet. Campingen har platser med stängsel och med skugga. Camping Le Palais de la Mer ligger i närheten av en sandstrand. Det finns möjlighet att hyra husbilar. På campingen finns en lekplats och ett sportområde. För den sportige semestervandraren har campingen olika cykelleder. Det finns ett underhållning och ett fitnessrum. Vem vill inte efter en hård dag slappna av i en jacuzzi och ett ångbad. Campingen förfogar över en utomhusbassäng och ett knattebad. Det finns också en vattenrutschbana. I den närliggande omgivningen kan du också simma i havet. I Camping Le Palais de la Mer är det tillåtet att vindsurfa. Denna inspektör gör varje år ett besök på Camping Le Palais de la Mer och inspekterar campingen för ca 200 faciliteter och för andra förekommande punkter. Inspektören är en medarbetare från ACSI och arbetar inte för campingen. Gillade - Campsite facilities were excellent and we all thoroughly enjoyed the swimming pool and slides. Ogillade - Not enough toilet roll in the bathrooms, and some showers were cold. Gillade - Pitch was clean and well presented although the water tap was a little awkward to use. All washing facilities and toilets were very clean. The swimming pool was excellent and the Life guards. The beach was so close it made our holiday. The shop was well stocked, staff very friendly and helpful. We shall be returning next year. Ogillade - The animation team were great from what we could see but not very inclusive for non french speaking children which was a shame. The restaurant was good but lacked choice of snack type good at lunch time, only Chips (frites) available as snack choice or full menu which was too heavy for the children. The older amenities block on our side of the camp didn't seem to have water as hot as the new block. The dishwashing area never even had warm water which was disappointing but we used the facilities in the new block which had hot water. Gillade - Friendly family-orientated site with very helpful staff. Pitches and cabins are close together but feel private because of the many trees and plants around. A gate from the site to the beach and fantastic swimming pools and water-slides make this a perfect location for swimming and sunbathing. Ogillade - We booked this larger (and more expensive) bungalow because we were assured we could arrive on Thursday 7th and this one would be available . When we arrived we were put in bungalow 66 because 137 was occupied and we had to move on Saturday. Gillade - Peaceful and beautiful surroundings. Close to beach and amenities. Lovely support from owner and employees - nothing is too much trouble. Ogillade - Our first camping experience and it was excellent though bungalow bedroom was very small for 2 people in their 60s! Otherwise it was perfect! Vill du boka campingen Camping Le Palais de la Mer eller få mera information? Det går bra med nedanstående uppgifter eller via campingens webbsida. 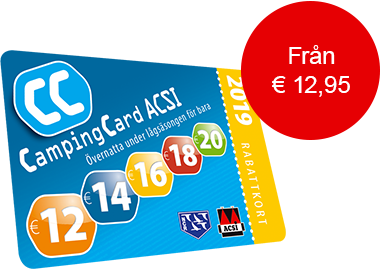 ACSI Eurocampings skickar din informationsförfrågan till "Camping Le Palais de la Mer".